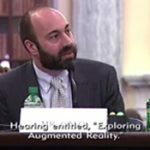 Lab Faculty Co-Director, Ryan Calo, testified before the U.S. Senate Committee on Commerce, Science, and Transportation at a hearing exploring augmented reality. With widespread adoption, PokemonGO has brought the novel policy considerations of augmented reality to a wide audience. Over the last week, members of the Lab have highlighted some of these issues. Co-Director Calo, noted the novel nature of a game that requires players to physically travel and potentially actionable nuisance created by the developers (Verge). In an article in New Scientist, Emily McReynolds highlighted the benefits of including a diverse set of stakeholders in the design of these applications. On June 22, 2016 C0-Director Calo testified before the German Parliament, the Bundestag. He answered questions as part of a hearing before the Committee on the Digital Agenda on "The Effects of Robotics on Economics, Labour and Society." He answered questions about the application of robotics, automation, and artificial intelligence for economic growth; and identified a number of issues regulatory issues legislators will face.